Myrtie's story began in the 1920's, when a new breed of summer visitors began to trickle into Eureka Springs over dusty Ozark roads. No Victorian elite, these folks. This bunch squeezed their pennies hard and traveled tourist class. They carried their accommodations with them, usually a tent, camp-stove and basic provisions strapped on the running boards, fenders and trunks of their basic black autos bearing Henry Ford's last name. One of the favorite spots to pitch a tent in Eureka Springs in those days was the site where the Inn of the Ozarks is located today. Here, wayfarers rented camping space for 25 cents a night. The fee included the use of a small pine-plank building, which housed showers and restrooms. Now you can imagine how bored these folks got with their own cooking. Pork and beans could only be served in so many ways. Up here on the hill, there were no eating establishments to offer a culinary change of pace. In those days, dominoes was a game you played with a bunch of little tiles that looked like flat dice. Enter Myrtie Mae to the rescue. A widow, Myrtie lived in a modest house near the campground (and near the present location of the restaurant bearing her namesake), where she raised her six children the best way she could. She wore a lot of hats - mother, practical nurse, warm and jolly human being, ex-farm wife and darned good cook. Myrtie saw an opportunity to use her cooking skills, and she took the plunge. After "test-marketing" her cooking one summer, she nailed a sign announcing; "Home-style Chicken Dinners" to a maple tree along the highway to the campground. Just like that, Myrtie was in business. 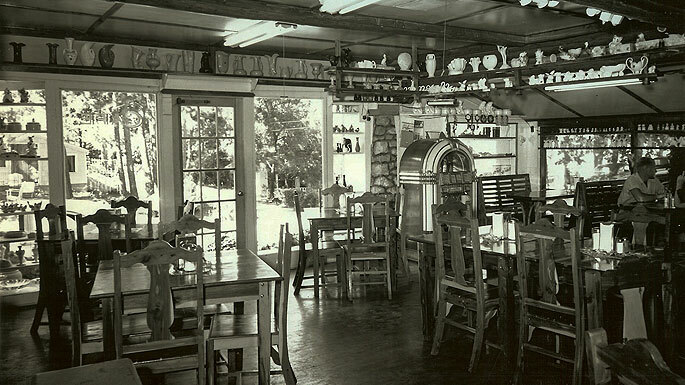 Myrtie's establishment was her own dining room, which held a large round table with eight chairs. A wide range of breakfast choices was offered, but lunch and dinner consisted of just one entree item - Myrtie's fried chicken, surrounded by bowls of creamy mashed potatoes, rich cream gravy, vegetables, homemade jams, jellies and relishes, plus homemade bread piping hot from the oven and fresh-churned butter. You might say that Myrtie was also a pioneer in the fast food business. When a group appeared on the front porch, she would quickly count mouths and dash out back to kill and dress a young chicken or two, and then proceed to have the meal on the table in 30 minutes - cooked to perfection on her wood-burning stove. Myrtie's wood-burner gave way to a "modern" kerosene-burning model in the later years, but Myrtie never trusted the new stove. When the campground began providing cabins for rent instead of tent space, Myrtie built several cabins of her own, and she also rented rooms in her home. She continued to serve "home-style meals" for over 20 years. Serving Eureka Springs' visitors was Myrtie's opportunity to swap jokes and entertain diners with tales of the Ozarks. She enjoyed being a hostess. Friends of Myrtie said that she waited impatiently through the Ozark winter, looking forward to the first hungry tourist of spring.